I am pretty impressed with Yebhi.com, although I feel they have focused less on making it friendlier for its user. Normally on my iPhone, I wouldn’t want to really go to a bigger screen unless its for watching a movie. Even shopping is something most of us with 3G or WiFi connections today would wish to finish on our phones. My perspective here is of websites matching user convenience and user friendliness. Let’s see how Yebhi.com lost 3 of its 5 stars on my ranking today. 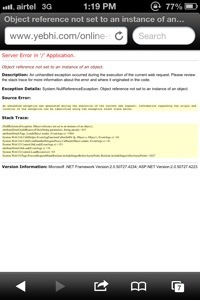 When I went to Yebhi.com on my iPhone’s native Safari browser, I found it most annoying to see the desktop version of the website open up. Too small to experience anything great, I had to repeatedly use the pinch to zoom. Not done. There goes a star. Scrolling through the menus is quite a tedious task. Seems like that was never built keeping the mobile screen in mind. This also accounts for their checkout and payment screens being really tiny. There goes another star off their rank. When I searched with even one letter they gave me some results, however when my search string was a blank space, it too me to an error page like the one below. Not expected and that lost them the third star. 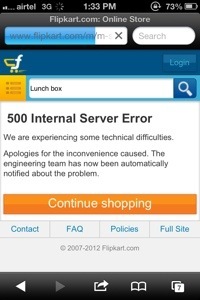 At the same time, Flipkart’s error page for an unknown string was as below. And what made me happy to see is that their mobile is much better and friendlier than their main website and even on their error pages they have the continue shopping button, as expected. Don’t you think bettering user experience is the key to effective branding?